Thompson Suburban Dental Lab offers the latest in denture technology with Digital Dentures. We are excited to offer you and your patients the latest and most innovative solutions that dental science has to offer. We proudly specialize in two top digital denture options, AvaDent and Pala Digital Dentures. Using 3D scanning and sophisticated software, the process of denture design is now fully digitized, allowing for precision in fit and reduced appointment times. This makes final denture fittings at the second appointment a possibility. There is also digital back up, which ensures the patient can always get the same aesthetics for their lifetime. Having full design control has made it possible to move the diastema, lower the bite, adjust the mid-line, change tooth molds, completely change the setup, or anything else that is possible with conventional techniques. All of those actions are now fully digitized and easily adjusted, saving time and helping to create the most comfortable denture possible. Digital Dentures are the future. 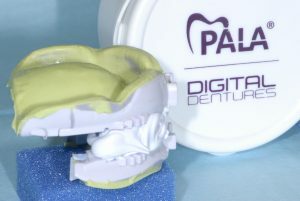 PALA Digital Dental offers the world’s most advanced denture solution for dentists and patients alike. The PALA process has been described as a win-win-win for practices, labs, and patients. 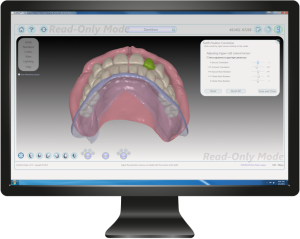 This system uses highly advanced CAD and 3D software to model dentures for the perfect fit with excellent esthetics. Labs can now deliver in a fraction of the time as conventional systems. Using the Digital Denture impressions tray, the dentist captures not just the impression, but the bite registration and vertical dimension. It is now possible to capture the measurements of three visits in just one sitting; the scan is then forwarded to Pala for renderings and for printing of a 3D prototype. The lab examines the dentures and sends it to the dentist who places it with that patient. Once approved, the end product can be created and reach the patients hands in record breaking time. The combination of dramatic time savings, digital precision, and the exceptionally life-like esthetics of PALA denture teeth makes the PALA Digital Denture System an exciting upgrade for dental practices, laboratories, and patients. Contact our denture department to learn more about digital dentures, start today and join the revolution. 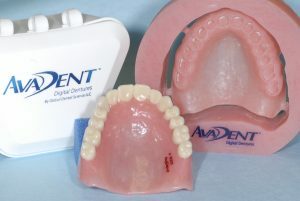 AvaDent’s digital platform is revolutionizing dentures. AvaDent uses Computer-aided engineering software (CAE) whose sophisticated set of algorithms mean less work for the dentist and the lab technician. Computer-aided Engineering (CAE) is being used in dentistry to design and build the next generation of removable prosthetics. Dentistry will always be part art and part science; with the addition of AvaDent’s improved digital workflow the dentist can focus on the art and in turn see more patients and provide a better quality product. In addition to the many advantages to the practitioner, there are also many benefits to the patient. AvaDent is not only an easier, faster and better approach to creating dentures, but it also provides more security to the patient in the form of a permanent digital record of their prosthesis. If dentures are then lost or damaged, replacements are fast and efficient.